Because your trust matters, 100% Money back guaranteed. Everybody loves the Samurai! 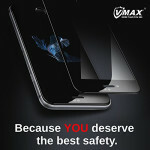 Providing you with safe & effective screen protection. Everything you need to protect your iPhone!